April is Occupational Therapy Month! OT’s are part of a vitally important profession here at Benedictine that helps students participate in the things they want and need to do through the therapeutic use of everyday activities. Meet Theresa, who has been at Benedictine for nearly 4 years as an Occupational Therapist. With 25 years of experience, Theresa began her career as a Certified Occupational Therapy Assistant, or COTA, after graduating from New Hampshire Technical College. Theresa went on to earn her Bachelor’s degree in 2005 from Penn State University and has worked in many areas from pediatrics to geriatrics. 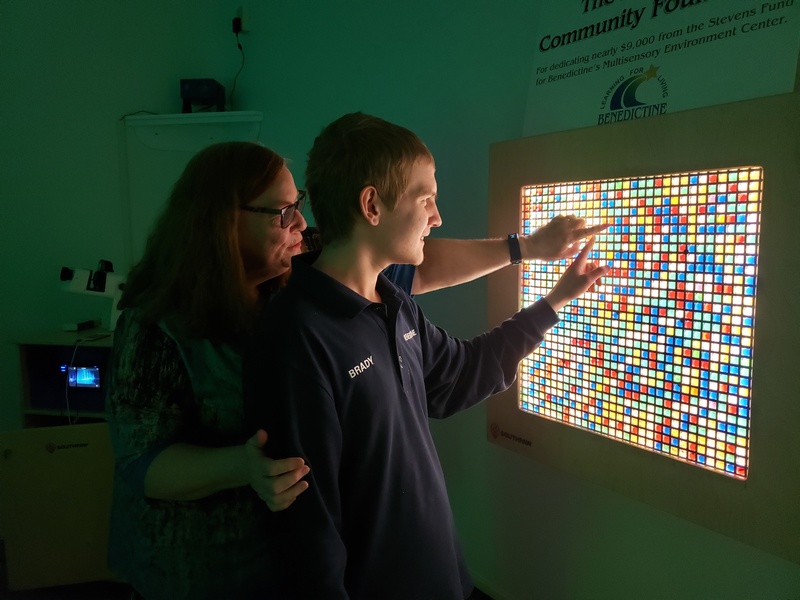 About the picture: Brady and Theresa are interacting with a Marvelous Marble Panel in the School’s sensory room. The panel is made up of iridescent marbles that fit into a steel grid illuminated by diffused lighting. As the student runs his hands over the marbles, they receive visual, tactile and audio sensory input, and experience a calming sensation.